Saltpeter beds, 1683 English ed. by Lazarus Ercker. (Prague, 1574). In my last post, dogs seemed to be popping up everywhere, even though they were essentially unrelated to the subject at hand; never one to be satisfied with enough of a good thing, I think I will keep the ball rolling. In the era of glassmaker and alchemist Antonio Neri (the early seventeenth century), it was commonly assumed there was a direct causal connection between the "macrocosm" (stars, planets etc.) and the "microcosm" (the very small), with human life on earth standing in the balance, in-between the two. This philosophy forms the basis for astrology, which in Neri's time was utilized for all sorts of decisions and the planning of events. Even so, there was much debate about what the exact connections were and how they worked. This cosmic theory of the very large being directly connected to the very small is an ancient idea that precedes even the discovery of saltpeter, today's topic of discussion. Saltpeter was the critical ingredient of gunpowder, fireworks, fertilizers, medicines and as we will see, even the preparation of materials for glassmaking. It undoubtedly held an important place in Antonio Neri's alchemical cabinet. This week in September, Sirius makes its reappearance in the evening sky. Just after dusk, you can find it following the sun toward the horizon to the west. Since it is the brightest star in the night sky, it tends to be visible before other stars. In Renaissance Italy, this evening event heralded the end of summer’s heat and the start of cool autumn rains. Which, among other things, meant it was time to harvest the saltpeter, before it washed away. Chemically, saltpeter is potassium nitrate,  although several similar compounds have traditionally been referred to by the same name. The term derives not from the name Peter, but from the Latin word for rock "petra"; it often forms on the walls of caves as mineral deposits, hence "salt from rocks." In China, where saltpeter was first put to use in gunpowder, it was widely collected from caves. Eventually it was discovered to be more prevalent where bat droppings were to be found. As a result, a new "organic" open air method of production soon gained favor. You may have noticed this; when animal dung sits in the barnyard for a while and there has not been any rain, a powdery white deposit starts to form on what is exposed to the air. That white powder is saltpeter. In France, saltpeter production turned into a cottage industry, with large beds being maintained, covered from the rain. 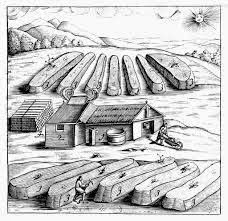 Beds were prepared several ways, but the most straightforward was to mix dung with potassium rich wood ash and straw and let it sit for up to a year, then flush out the saltpeter with water. The liquid was carefully collected and further purified. While he was visiting in Antwerp, Neri makes particular use of saltpeter in his recipes for his colorful chalcedony glass "adorned with so many graceful and beautiful areas of undulations and enhanced with the play of diverse, lively, flaming colors." He presented "His Excellency, the Prince of Orange, with two vessels of this chalcedony, which delighted him greatly." In the recipe for this exotic glass, he makes extensive use of aqua fortis, acids for which saltpeter was an essential ingredient. These were the strongest acids known and the only way to dissolve precious metals like silver and gold. Neri uses a few gallons of these acids in the preparation of the ingredients for a single batch of his chalcedony glass. These acids were themselves thought to be composed of common water that had been infused with "powerful spirits." If Neri shared Sendivogius' reasoning, he might have thought that the process of making the acid was one of transferring the spirits of the air into water. Due to precession of the equinoxes, the date when Sirius rises and sets with the sun has shifted later by about 25 days. In the Egyptian calendar of 3000 BCE the start of "dog days" coincided with the summer solstice. It is also called niter, with the chemical formula KNO3, composed of potassium, nitrogen and oxygen. Again, there is no direct evidence of Neri's route, or that he was familiar with Sendivogius or the book. In Discorso (Neri 1613), he does mention alchemist Alessandro Scotus, who was released from prison by Sendivogius in 1590, after a conviction of practicing alchemy in public. See Grazzini 2012 p.346, n.55.